Eden Hazard has revealed he has spoken with his father about Chelsea contract. 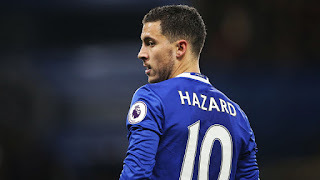 Last year Thierry Hazard 'Eden's Father' revealed his son had rejected Chelsea's latest offer because he wants to see if Real Madrid will bid for him. But Eden Hazard has now come out to rubbish his father's claims and also revealed that he is happy at Chelsea. Hazard said:" My dad says some bad things"
"I talked with him, no worries. I'm focused with Chelsea. "I've got two years contract left and I'm happy here. Like I said 10 times before, I want to finish this year and then we'll see. But I'm happy here." Would you like to see Eden Hazard join Real Madrid?